Back in my school days, I got into Magic: the Gathering, as was the thing for geeks my age. It was a clever card game that seemed like unlike anything else that I've seen and it quickly became a bit of an obsession. But over the years, I eventually quit Magic because I couldn't keep up with the number of new cards being released season after season. Smash Up is one of the new card games out there that are less about building the perfect deck and instead working with what you have. We've seen deck-building games where the cards at your disposal change based on what you can pick-up in game. But Smash Up tried to keep things innovative by describing this as a "sufflebuilding" game. I don't play enough Smash Up, admittedly, since I get obsessed about having the right type of plastic sleeves for the cards. And given they've released a few new expansions over the past year, we've needed to add more and more sleeves to our collection. 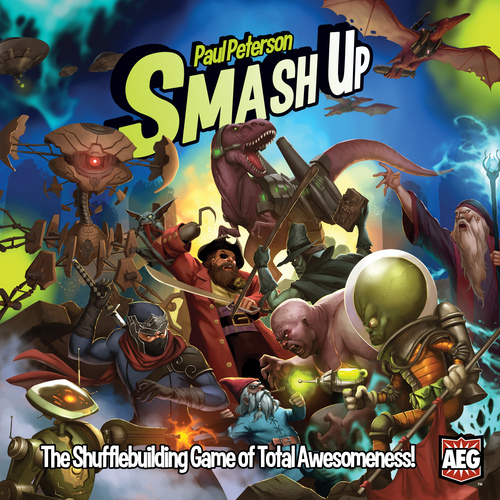 Smash Up is a shufflebuilding card game created by Paul Peterson. It supports between 2-4 players and already has a number of expansions out. In Smash Up, each player will build a 40 card deck by selecting two different factions. Each faction (including Ninjas, Wizards and Pirates) has a set of 20 cards that you get to shuffle together for a new play experience every time. This base game includes 8 factions, so that's a lot of combinations. And each faction naturally has their own specific flavor and potential strategy - but more on that later. What is important to remember is that the main goal of the game is to score a total of 15 Victory Points by scoring bases. There are only two types of cards. Minions are your little creatures that will be important in scoring bases. You don't really attack other creatures directly (although they may have special effects that remove other creatures) - Minions are all about scoring bases. Action cards are pretty much special effects that play out from your hand. Actions might allow you to play additional Minions or Actions or it could have other effects like boosting the Power of Minions. Your basic turn order is simple enough. There's time for any special start of turn effects to happen. Then you can play up to one Minion and 1 Action card in any order. Then you check if any bases score - and this consists of adding up the total of all Minions at a particular base (including those of other players). If a base does score, the points awarded based on what's written on the base card and all Minions there are discarded. Then you draw 2 cards (with a maximum hand of 10), and then let any end of turn special effects happen. And this goes on and on until a winner is determined. The overall gameplay was nicely thought-out and there's a good amount of balance that manages the strategic balance. And the fact that everyone is limited by pre-set faction cards makes it pretty easy to learn the game and focus more on innovating strategy. The main draw of the game definitely lies in the different factions and how each plays so differently. For example, Zombies tend to come back into play even when they've been discarded while Robots tend to grow in number quickly even though most of them seem under powered. But you will always have two factions in a deck and so the trick is figuring out how to get the two factions to work together. And thus new strategies come up based on the factions you select. My main issue with the game is the fact that its limited to four players, but admittedly I can see how the gameplay will break if you try to go beyond that number. If you do have more players and you have sufficient expansions in your collection, you're more than free to run parallel games instead. Smash Up is a great card game to add to your collection and one that fosters the fun of such card games without the burden of everyone buying more and more cards just to keep up. Thus the game gets a good 4.5 surprise faction combos out of a possible 5.